Family medicine in Yakima. Family medicine near me. Dr. Backer was born and raised in Buenos Aires, Argentina, where he also attended medical school. He moved to the United States in 2003 to complete his residency and a combined fellowship in Adult & Pediatric Infectious Diseases. Dr. Backer has a special interest in international medicine and participated in several medical missions. He traveled to rural Haiti during a cholera epidemic and spent a month in Malawi, Africa, in 2009 as part of a pediatric AIDS program. Dr. Backer is fluent in Spanish and English. He is happily married and has a dog and a cat. In his spare time, Dr. Backer enjoys spending time outdoors exploring the Pacific Northwest. Favorite hobbies include hiking, tennis and soccer as well as sharing a good meal with his family and friends. Medical school: Western University of Health Sciences, Pomona, Calif.
My father was the main influence in my pursuit of medicine. When I was a kid, I tagged around with him everywhere. My dad was always a calm reassuring presence. Mostly I realized he was a good listener. I wanted to be able to have the same meaningful relationships with people that he did. It was a dream fulfilled when I became his partner later on. Everyone has an interesting story, and that is what I really enjoy about my job. I enjoy doing a variety of things from house calls to osteopathic manipulative treatments, to procedures. There is something/someone new every day. I see myself as providing advice and treatment to people. It is up to them whether they would like to follow my recommendations or not. It' home. I grew up in Selah. I love the climate, people, weather etc. I love all things agricultural. My folks had an orchard when I was growing up and I spent all of my summers out there. I enjoy the outdoors with my wife and three daughters. We hike and ski whenever we can. We have a small farm in lower Naches where we raise cattle/hay and a few goats. I am an amateur radio operator (KB7OFH), and the current resident bassist at Selah Covenant Church. What inspired you to choose medicine? I’ve always enjoyed helping others and find the human body to be very complex and interesting. Why did you choose your specialty? I like the variety of medical issues that Family Practice provides. I also enjoy working with all ages and family members. What is your philosophy of care? To be a partner in one’s health, including physical, mental and emotional well-being. What do you like about Yakima? I was born and raised here, and I like the small town feel. I also like the diverse population. What do you like to do outside of work? I enjoy time with family, the outdoors and playing hockey. Born in Toppenish and reared in Central Washington, Dr. Olden is the founder of Pacific Crest Family Medicine. He is devoted to family medicine and seeks to give every patient a personal medical home to meet their comprehensive medical needs. Dr. Olden received his Medical Doctorate degree from the University of Washington's School of Medicine in Seattle. He completed his residency at Oregon Health Sciences University in Portland before returning to Toppenish to serve Indian Health Services from 1984 to 1995. Dr. Olden seeks open communication with patients in a friendly, interactive way that makes them feel comfortable while still answering their important medical questions. The secret to patient-centered care, he says, is taking the time required to meet the patient's health care needs. So often, just as the appointment is wrapping up and he's walking toward the door, a patient will mention an "after-thought" question or "by the way" comment that turns out to be really important. He welcomes these as opportunities to understand what's really going on in the health of his patients. What makes Dr. Olden a truly great physician and someone everyone enjoys having around comes down to this simple philosophy: "I love life. I love people. And I love what I do," he says. Dr. Olden is active nationally and internationally in maternity health care, and serves on the national faculty of the American Academy of Family Physicians' Advanced Life Support in Obstetrics course (ALSO). He serves on the international ALSO Advisory Board and has traveled to Europe and Central Asia to train other physicians. He and his wife Susan, a fourth grade teacher at Summitview Elementary, have been married for more than three decades. They have four children, three sons and one daughter. In his personal time, he enjoys carpentry, woodworking, camping, baseball and traveling with the family. 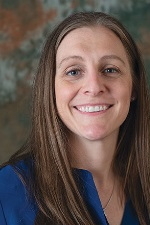 Dr. Anne Teerink is a native of the Pacific Northwest, growing up in Redmond, Washington and graduating with a degree in biology from Gonzaga University in Spokane. She met her husband, Dr. Duane Teerink while attending medical school at Kirksville College of Osteopathic Medicine in Missouri. Dr. Anne's sense of humor and friendly, conversational nature contribute to her philosophy of care that centers on open communication and working as a team with patients. While Dr. Anne encourages patients to make healthy lifestyle choices that will ultimately benefit them, she understands that the best results come when doctors and patients work together toward the same goal. She values medication, but sees it as a treatment that should come after a lifestyle review. "It's amazing what people can do when they have the information they need to lead a healthier life," she says. Dr. Anne encourages patients to be open, honest and realistic about what they are willing to do for their health. "Ultimately, compliance is important. If I have a diabetic patient whose lifestyle or nature isn't going to support them taking a pill three times a day, then I need to work with them to find a solution that they can commit to. I want people to have the best possible healthcare. That requires a partnership between physician and patient." she says. In their personal lives, the Teerinks enjoy spending family time together outdoors - golfing, hiking, skiing, camping - and keeping up with their young children. Growing up in Minnesota in a family that farmed for generations, Duane Teerink, D.O., combined his love of science with his desire to help people when he chose to become a family practice physician. While in college, at Northwestern College in Orange City, Iowa, he spent two-and-a-half months volunteering his time with a medical mission's team in Ghana, West Africa. A devoted doctor and family man, he met his wife, Anne Teerink, D.O., also a physician at Pacific Crest, when they were medical students at Kirksville College of Osteopathic Medicine in Missouri. Dr. Teerink lights up when he talks about the holistic philosophy he and Dr. Anne share with regard to treating the patient, not the disease or symptom. He emphasizes the importance of listening to his patients and treating them as a whole person - a trait his wife says he does well. Dr. Duane also believes in what he refers to as medicine that takes into consideration the body, mind and spirit. The Teerinks enjoy spending family time with their son and daughter outdoors - golfing, hiking, skiing, camping. Dr. Paul Tompkins grew up in various places across the United States - Florida, Central Illinois and California. From an early age, medicine intrigued him. He tried various fields of work before coming back to medicine. He graduated from medical school in Oklahoma and completed his residency in North Carolina, specializing in Internal Medicine and Pediatrics. Prior to moving to Yakima, he worked at PacfiCare Clinic in Tamuning, Guam. He has experience in peer counseling and cross-cultural communication. Dr. Tompkins truly has a passion for what he does and it shows in the care he provides his patients. He sees himself as a partner in helping his patients establish and maintain their best health possible. "Patient choices make a great deal of difference in their health." Dr. Tompkins and his wife have one child. In his spare time, he enjoys gardening, classical music, drama, literature and snorkeling. What inspired you to choose medicine? I have a strong desire to help educate people on their health, and teach them how to live their best lives. I come from a long line of amazing Registered Nurses, and that experience from a young age helped to influence my decision to also enter this rewarding profession. Why did you choose your specialty? I didn’t want to limit my options in my practice, and I am fortunate to work with people of all ages and stages of their lives. Caring for patients who are newborns all the way up through grandparents and great-grandparents helps to keep my job exciting, and I enjoy taking care of entire families. Other medical interests or special services you offer: I am a Certified Lactation Counselor and I find great joy in helping Moms through those sometimes challenging early days of breastfeeding their new babies. My goal is to help reduce the psychological as well as physical demands that raising a newborn can place upon both parents. I am also a Certified Medical Examiner with the Department of Transportation (DOT). Additionally, I have special interest in PCOS and Diabetes Management. What do you like about Yakima? I moved to Washington in 2012 from Southern California, where I was born and raised. I’ve lived in a few different regions around Washington state, and we realized that we prefer experiencing all four seasons. We love to participate in many sports year-round, and figured that Yakima is a great place to foster our love for the outdoors. With mountains and lakes nearby, and the city traffic a distant memory, Yakima is where I want to continue raising my family. What do you like to do outside of work? I enjoy exploring the great outdoors with my family and friends. I love to run, ski, snowboard, wakeboard, fish, camp… you name it! What inspired you to choose medicine? I have a strong desire to help other people and great respect for the medical profession. What is your philosophy of care? Treating patients how I’d like to be treated. What do you like about Yakima? I was born and raised in Yakima, and I like the four seasons, nearby mountains and the family-friendly atmosphere and certainly, the lack of traffic. What do you like to do outside of work? Spending time with my family, going to church camping and other outdoor activities.